According to a leak of the France-Elsevier deal, while France has cut $400 million Euros from the budgets of its academic institutions, at the same time the country secretly agreed to a 5-year $172 million Euro deal with Elsevier. That's a systemic annual budget cut of $80 million Euros and an Elsevier annual payment of $34 million Euros. I don't have details about academic employment in France. However, assuming the same situation as in North America it is likely that this will primarily impact the employment prospect of new graduates in academia, and/or may cause some professors to accept early retirement. In effect, again assuming a similar situation, this means that many more new academics will accept very part-time, poorly paid positions with little or no benefits or job security than would otherwise be the case. How big is the problem? Assuming an average full-time academic salary of $100,000 Euros per year, $34 million Euros could fund 340 full-time academic positions (1700 annual salaries over 5 years). Even if Elsevier took half the amount (not unrealistic since the company's current profit rate is close to 40%), that's still 170 full-time academic positions. Note that Elsevier is only of the very large highly profitable commercial scholarly publishers - to assess the full impact of publisher profits on academic work it is necessary to take other publishers into account. 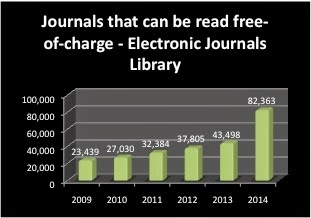 And that's at Elsevier rates - by my calculations, we can flip the current subscriptions system to one that is fully open access, and, if we're smart, at a small fraction of the cost - again by my calculations, the current average spend per article for the DIY academic publishing largely reflected in journals using Open Journal Systems - is $188 per article, just 4% of the world's global library annual spend per article in subscriptions journals. Redirecting this money to academic salaries could do a lot towards revitalizing universities. If readers have citations to data on academic salaries and/or employment in France, that would be helpful.